Hubbell Wiring Device-Kellems provide Rough-in Ready Configurations for New Construction and Retrofitting Electrical Installations. 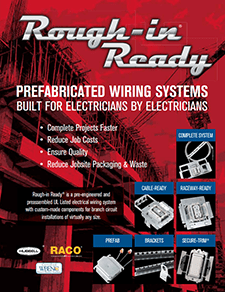 Hubbell’s Rough-in Ready® system of prefabricated electrical support products is ideal for projects requiring repetitive wiring installation. All pre-fabricated assemblies and cables are labeled to match a detailed layout drawing. Any electrical project will profit from a Rough-in Ready® system, but projects with many similar rooms provide the biggest benefit to the installer. Contact your Hubbell sales representative and provide specifications and drawings for the project. Once quotation is accepted and purchase order is issued, Hubbell will provide a formal submittal for approval. Product will be delivered in clearly marked skids by floor and area, depending on your job site requirements.